Vancouver’s Director of Planning – and Planetizen blogger – addresses the question: Does City Hall stifle good design? Some have suggested to me that City Hall sometimes goes too far in shaping the City. That some rules, guidelines or approaches are too prescriptive, too specific, instead of being open minded to better ways to address design aspirations. I’ve listened with an open mind, and have myself observed some examples of “Cadillac” guidelines that might warrant either a re-think, or at least a “squinty-eyed view” when it comes to interpretation. We should always maintain an open-mindedness that doesn’t let a rule stand in the way of a better city-building idea (although we might find ourselves disagreeing on whether an idea is in fact better). I must say though, I’ve seen great examples of inventiveness and open-mindedness here at City Hall, where the rule book got set aside for a better idea. More examples than in other cities I’ve worked with across Canada, where I was often the one trying to get the better idea through. Some of our best projects have been the result. The whole post can be found here. Globe and Mail architectural critic Trevor Boody takes a look at the designs approved for Olympic-site housing in South East False Creek, and is not impressed. The Academy of Music on Vanier Point. Not too many people know about it, thankfully, since it’s another of those 70s-style bunkers they built back then, like the Archives. What makes it my top choice is the lost opportunity. Shouldn’t an Academy of Music be a graceful, inviting, significantly placed icon in the fabric of the city? This is none of those. Randy Gragg, one of the best writers on urban design and architecture in America, profiles a Portland developer, Joe Weston, in an article in The Oregonian. Weston, who is building in the Vancouver Style, may the the first of many. Standing in the 27th-story penthouse of his soon-to-be-finished condo The Benson, developer Joe Weston foresees a taller, thinner Portland.The building is the city’s first “point tower.” Each floor will be 8,000 square feet or less, hence the “point” compared to the more typical Portland “slab towers” of 12,000 to 20,000 square feet. Vancouver, B.C., built hundreds of these more slender buildings in the past 20 years, increasing the city center’s population by more than 50 percent and drawing the attention of cities across the world for its combination of higher density and livability. For years, Portland has sent delegations of planners, architects and politicians north of the border to see them. 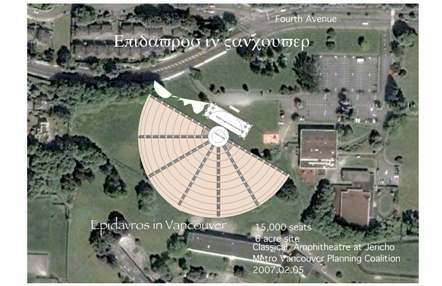 Looking at the land form on Jericho,-could we need a classical amphitheatre like Epidavras in Greece; big enough for 15 000 people, overlooking the beach, bay and mountains. Forget rain, we can deal with that later, but the urban form and the invitation to meet and on the stuffy west side. I think we need it. Even first nations might say, good idea, count the area in our contribution. Like the Greeks, I think there are some natural forms on that hill to make it work. It can be used for all the festivals already in vogue and a whole lot more. When not in use, like in Greece, the children play in it, old folks have tea parties. We do not have enough things to leave as ruins. And for those that say we could build another 200 condos … we need more civic spaces in the city. I also know why these classical spaces are frowned upon and not built in our society, but that is another chapter. Architect Bing Thom recommended I read this piece from the Tyee on the prospects for the Larwell Park site (just east of the Queen Elizabeth Theatre) – likely the location for an ‘iconic’ architectural statement. Thom worries that civic culture is sliding into the control of a few select, giant institutions that grab a dominant share of publicity and public money. 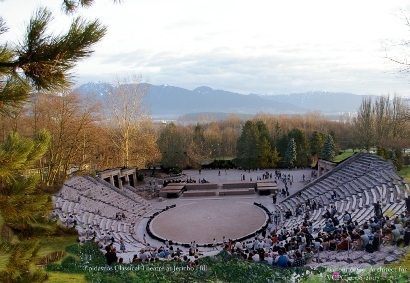 He argues that as Vancouver grows, it is in danger of mimicking other North American metropolises in adopting the same dominant assumptions of what constitutes important culture: opera, symphony, art gallery. But Vancouver culture is unique, argues Thom. For example, it’s more informed by First Nations and Eastern Asian values than other metropolises, so we shouldn’t necessarily adopt an a eye-stopping, starchitect-designed grand projet. The federal government maxes out its grants to cultural facilities at $30-million per institution; Thom wants the pie to be carved up in as many pieces as possible. 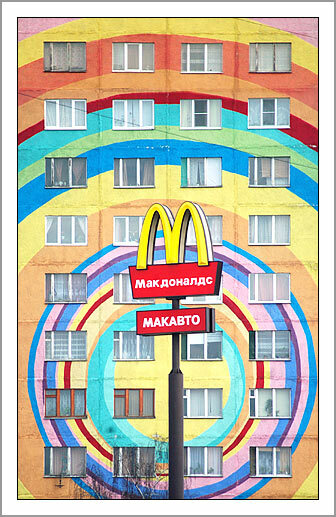 These painted highrises in Moscow are actually from a blog called Russian Art & Culture News. Not if you read the blog, says Michael, which apparently is quite a downer. Still, the pictures are cool. 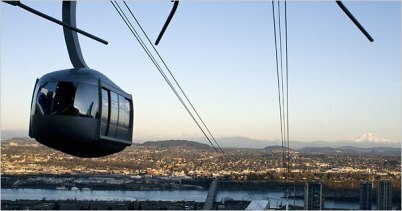 Brian Libby writes the definitive blog for those admirers of things architectural and urban in Portland. I sent him the recent issue of Price Tags on a comparison of our two cities – and he in turn has featured it in a post on his blog. Another example of the self-referential world of the blog – click, click, click. The Portland-Vancouver BC Mind Meld: Is Price Right? Click on over, add your perspective – and tell him I sent you. One would think that the Soviets would have come up with one universal design for this community structure – simple, functional and cheap to mass produce. 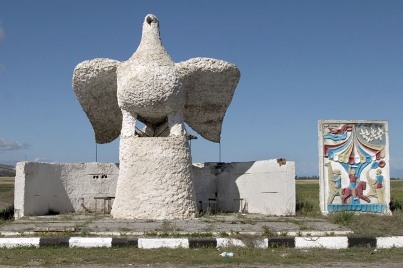 However, in many instances this was not the case, much time, effort and imagination went into many roadside bus stops…. The themes that these decorated bus stops took usually varied depending on the region, often reflecting the local culture, history, or industries. Can you identify the city in which this house is located? 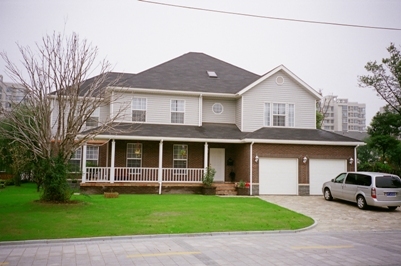 This photo could be of a single-family home in Langley, Surrey, Maple Ridge, etc. If you were to show it to your associates, chances are they wouldn’t guess Shanghai. (The licence plate on the van might give a clue). The homes are in a gated — and guarded — community in Pudong, a relatively new suburb of Shanghai. The enclave of single-family homes is surrounded by apartments, condominiums and markets.